Special Thanks to my Travel Team for making such Travel arrangements which allowed me to borrow some time out of my schedule. Most of us who are already VCP 6 - DCV Certified share a common goal of achieving the next level of certification with VMware "The Advance Certification" and it really take a lot of time / Hard Work and Dedication to achieve these Credentials. 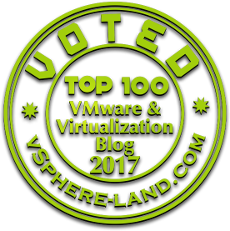 Thought of starting this VMware Certified Advance Professional 6 - Data Center Virtualization Design Blog Series because in most of the Training's i Deliver for VMware Education Services I get a same question from my Audience. The First and foremost thing to start with is to achieve your VMware Certified Professional 6 - Data Center Virtualization Credentials ? I Know It's a Question again for some of us on how to achieve VCP6 -DCV these credentials? So this is what you need to do ! Attend either one of these Mandatory Training Courses from VMware Education Services or from any VMware Authorised Training Center (VATC) before you appear for your VCP6 -DCV exam. All the above mentioned courses are from same track VMware vSphere which doesn't mean you cannot achieve your VCP 6 and VCAP6 credentials in any other Track. I mentioned only about the VMware vSphere courses here because in this blog post series we will be focussing on VCAP 6- DCV Design Track for all other tracks i would recommend you to follow below links. Once you have completed the above training course you can schedule your VCP 6 - DCV exam and my heartiest Congratulations for those who already are VCP's and wishing luck to all the aspiring VCP's. Now we are all set to proceed further with VCAP 6 - DCV Design Exam ! What about the Training Prerequisites ! Do we need to complete any Mandatory before appearing for VCAP 6- DCV Design exam ? Well there is no as such Mandatory training however to align yourself more towards the goal of achieving your VCAP 6 DCV Design credentials, VMware Recommend attending the VMware vSphere: Design and Deploy Fast Track [V6] which talks about the Exam objectives for VCAP6 -DCV Design and gives the audience exposure to Design Scenarios where in they can Create their on Design and can also have a Healthy Discussion with their Instructors about the Design. Objective 1.1- Gather and Analyze Business Requirements. Objective 1.2 - Gather and Analyze Application Requirements. Objective 1.3 - Determine Risks, Requirements, Constraints and Assumptions. 2) Create a vSphere 6.x Logical Design from Existing Conceptual Design. Key Note - It's a Journey dedicated towards achieving these objectives and "VCAP 6 - DCV Design Credentials", I will be writing a series of Blog Post on how to work towards each Objective wherein will be discussing Key Aspects Related to VMware vSphere Design and would also be sharing few useful link's which will be acting as an Helping Hand for us to reach towards our Goal.